Kruger recently held a dedication ceremony for its rebuilt Paper Machine No. 10 (PM10). 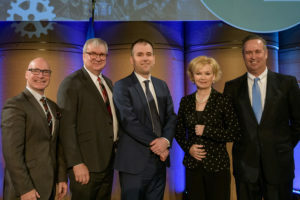 Kruger invested $250 million in this project to completely rebuild PM10 to manufacture 100 per cent recycled lightweight and high-strength linerboard at its Trois-Rivières Mill. Commercialized as XTR, the new linerboard grades manufactured on PM10 meet increasing demand for ultra-light packaging without compromising on strength, performance or environmental footprint. PM10’s annual production will total 360,000 metric tonnes of XTR linerboard, an exclusive product that Kruger is the first to manufacture in North America. A portion of the production will be used by Kruger’s packaging plants in LaSalle, Que., and Brampton, Ont., while the remainder will be sold to packaging manufacturers across Canada and the United States. Announced jointly by Kruger and the Government of Québec in September 2015, this $250-million project required generated major benefits for the Mauricie region and Québec. More than 80 local businesses were involved in the project. Of the total budget, approximately $40 million was spent with local suppliers and $60 million spent with suppliers elsewhere in Québec. At the dedication are, left to right: Jean-Denis Girard, Member for Trois-Rivières; Luc Blanchette, Minister of Forests, Wildlife and Parks; Gene Kruger, vice-president, business development, Kruger Inc.; Julie Boulet, Minister responsible for the Mauricie region; and Michael Lafave, senior vice-president and chief operating officer, Kruger Packaging.